Ever wanted to cook directly on the coals? Most of the time people use steak for this! I decided to switch things up by using tomahawk pork chops. The idea is the same, but the flavors can be totally different. So what are tomahawk pork chops though? 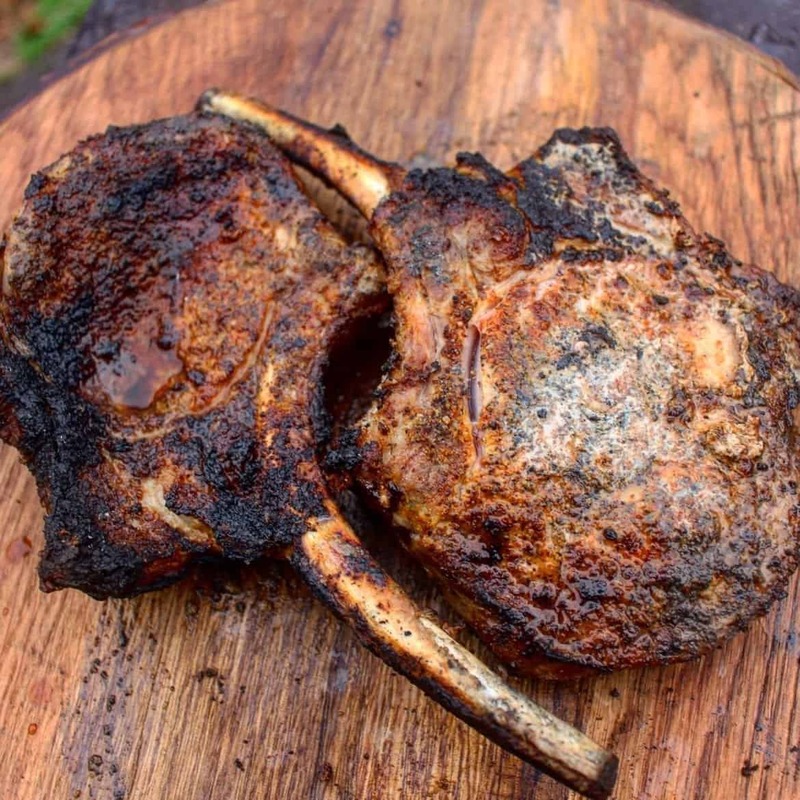 What are Tomahawk Pork Chops? Tomahawk pork chops are pork chops with the bone still on! They are delicious and full of flavor. They are also perfect for cooking on the coals because they can withstand the heat and create an amazing crust. Overall, it is a fun switch up to normal cooking on coals. Have you ever cooked on the coals? Firstly, pork is a bit tougher than steak so you must be careful to watch the meat constantly in order for it to cook properly.Once the pork is on the coals, then it is show time! Just be warned that flare ups may occur, so be ready to move the tomahawk pork chops around in case. Secondly, you must make sure the charcoals are white hot when you put the meat on! This is important because it makes sure that nothing sticks to the crust & that everything is clean. Lastly, make sure you are using a natural lump charcoal like Cowboy Charcoal. Natural lump charcoal is best because it avoids using chemicals that some briquettes tend to have. These guys are the ideal charcoal to cook on top of! 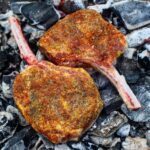 If you have any more questions about cooking on the coals for these tomahawk pork chops recipe, then read my how-to guide before cooking! 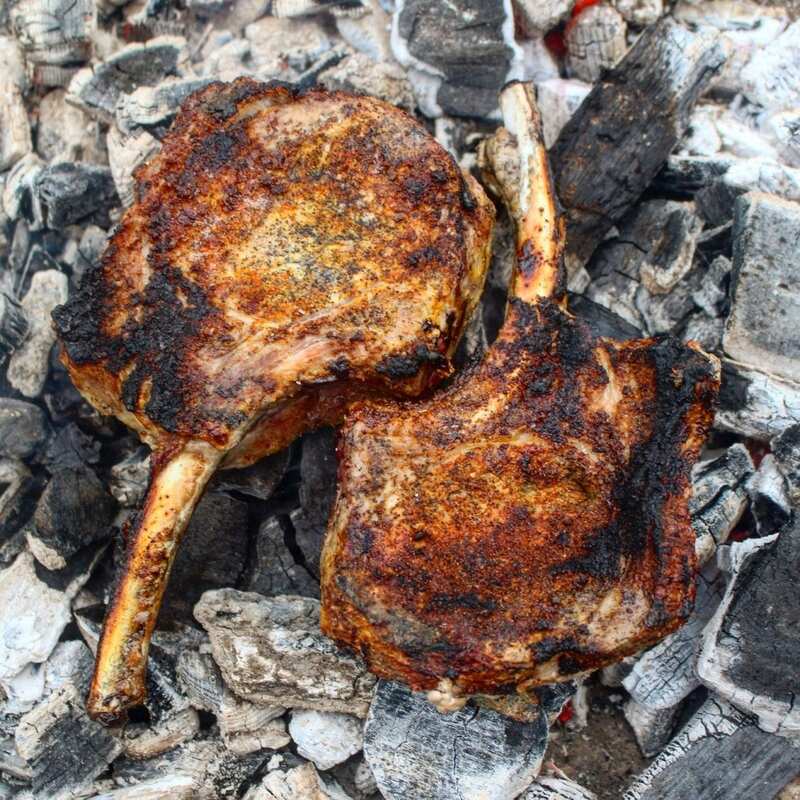 Deliciously good tomahawk pork chops cooked right on the coals with Cowboy Charcoal! When the pork chops are at room temperature, lather in mustard to help the other spices stick. Season the pork chops additionally with all the spices above. (Optional) Add some tin foil to the bone of the meat if you do not want it to burn. Place pork chops on top and let cook for 10 min per side or until internal temperature is 170F. Once cooked, dust it off and place on a cutting board to rest for 2 minutes. Equipment Needed: Cowboy Charcoal, tongs, cutting board & knife.